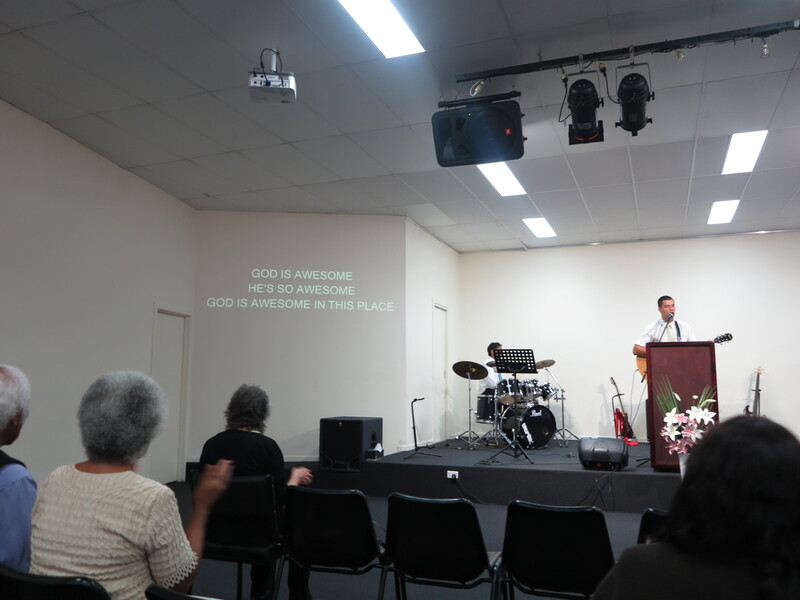 Kogan is an Australia company who are selling good-quality value-priced consumer electronics like LCD TVs in a manner that is considered common in the USA but rare in Australia. It is to sell the goods under their own brand through what used to be known as mail-order. You can buy equipment like this Internet table radio by visiting their Website or calling 1300 304 292. The set, which is sold direct for $169 excluding delivery but including Australian GST, looks like a mantel radio made during the late 70s just before that style of radio went out of fashion and has a generous-sized front-facing speaker behind a mesh grille. An iPod or a USB memory stick can be connected to sockets installed on the top of the set. The set is powered from the mains through a small AC adaptor but the adaptor that came with the review sample had something that can be annoying if you were to properly switch it on or off at the wall, because it sticks upwards. The set has an iPod dock which can work with most of the Apple iPod range; and a USB port for connecting USB memory keys, MP3 players and other devices that present themselves as USB Mass-Storage Devices. This port may be better placed on the front or back of the radio so as to avoid dust, crumbs and other nasties falling in to the set and causing unreliable operation with USB devices. It also has a 3.5mm jack for connecting up another MP3 player, Discman or similar device to play through the built-in speaker; and has a 3.5mm headphone jack which can also be used to play the set through a pair of better-sounding active speakers. When you unpack the set, you don’t get the instruction manual as part of the packaging. 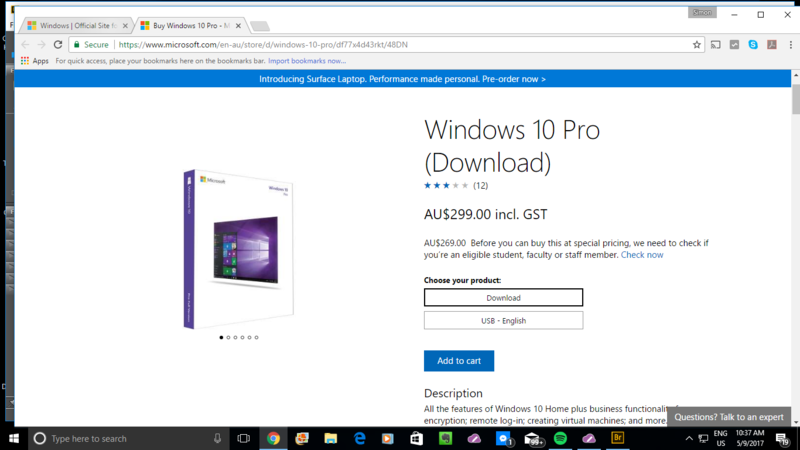 Instead, you have to go to the support section of Kogan’s web site to download the manual as a PDF file. There are some issues that affect the way you integrate the radio to the Wi-Fi home network. One is that there needs to be a clear indication for “enter” to confirm the WPA-PSK key and another clear indication for “backspace delete” of erroneous characters. 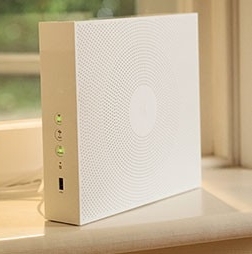 As well, you have to make sure that your router’s wireless-network security is working in a “pure” WEP or WPA-PSK mode rather than a “compatibility mode” that may be common on some routers made when WPA just started to come in as a Wi-Fi link-level security option. Once the radio is on the home network, everything is effectively “plain sailing”. The unit can be set up to get the time from the Internet, but you have to determine the time zone yourself by going to the Main Menu – System Settings – Clock Settings option. You will also have to change the time zone by an hour every time we switch from standard time to daylight-saving time. For example, in Sydney and Melbourne, you would have to set the Time Zone to +10 during Standard Time and to +11 during Summer Time. This may be rectified in a future firmware update for this set. As far as the DAB (digital radio) operation goes, there isn’t a “clean-up and scan” routine available. Typically you have to do the “full scan” routine which adds new stations to the multiplex roster. This was annoying because the review sample, like the Revo iBlik RS clock radio reviewed in a separate review, had come down from Sydney and had references to the Sydney DAB multiplexes and stations. It can also be a headache for those of us who move between towns, or if there is a situation where the DAB multiplexes are being re-organised. The menus on the set are mainly navigated through the use of the tuning control which you turn to select the option and press to confirm the selection. There is a “Back” button to go back through the menus if you need to do so. The volume is adjusted with a smaller knob rather than “up-down” buttons. You change between FM, DAB, Internet Radio, Media Player, USB, iPod and Aux modes by pressing a MODE button. This control arrangement makes the set appeal to be easier and comfortable for older people to use and makes you think of it as a proper radio. Access to Internet radio stations is through an integrated directory that is regularly updated. You can select stations by “home area”, “country” or genre. I did a test to find Heart 106.2 London, a radio station that I often listen to over the Internet. Here, I went to “all stations”, then “country”, then “Europe”, then “United Kingdom” to filter for UK radio stations. After that, I went to all stations and browsed the list of UK stations to find “Heart London”. There are five preset buttons which you can assign to a station in each of the radio modes. This means you have 5 FM stations, 5 DAB stations and 5 Internet radio stations held as “one-touch” presets You associate the button with the currently-playing station in the same manner as most car radios that are currently in use i.e. : hold the button for around 10 seconds until the display shows that the station is with the preset. The radio also works well as a DLNA network audio player with the ability to honour the UPnP AV Media Server’s media hierarchy. It even worked well with playing music hosted on my computer by allowing a smooth playout experience. One main problem was that the transport keys such as the play-pause button didn’t work for the network media stream. The radio does work well as an iPod speaker dock and the function keys worked properly when navigating the iPod’s content. I also attempted to adjust the volume from the iPod, but the sound came through at the same level, thus requiring you to use the radio’s volume control to adjust the sound. The sound was something typical of either a classic mantel radio or one of those mono radio-cassette recorders made during the 1970s. There isn’t any way to adjust the tone on the set, whether through the menus or a separate control. There is still some “punchiness” in the sound but not the full bass expected by today’s young generation. A difficult-to-reproduce piece like the BBC brass-band rendition of “God Save The Queen” played at the end of the day (UK time) on Radio 4 may sound “difficult” at times. For talk-radio broadcasts, the sound is clear and intelligible whether turned up loud or at a modest listening level. 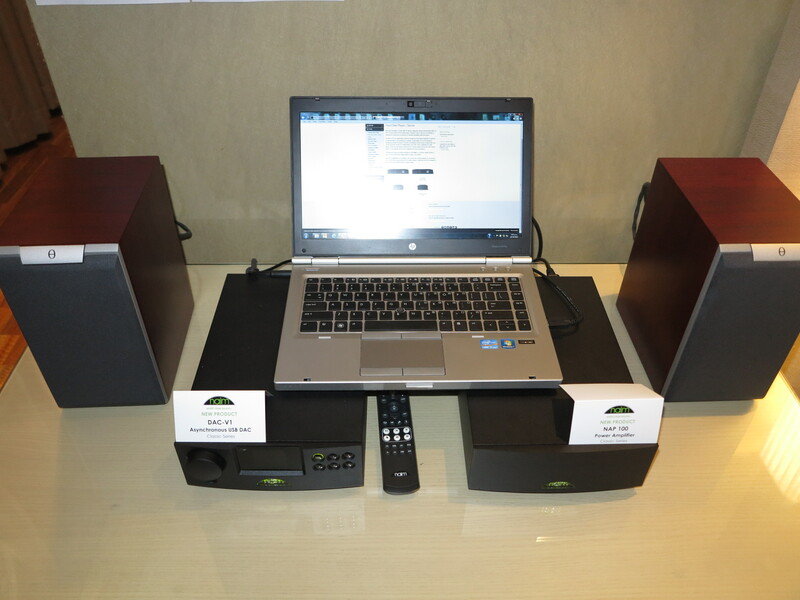 The sound volume is relatively loud, thus allowing the set to fill a room with its sound and can compete with a noisy appliance operated nearby. I even ran our noisy rangehood fan while the set was playing and it could easily compete with that. This means that it could work well at “belting out the tunes” in a takeaway-food shop, café or similar establishment. I have observed that this unit has avoided fingermark-attractive “gloss” finishes but this may be considered as a set that is dull and boring. 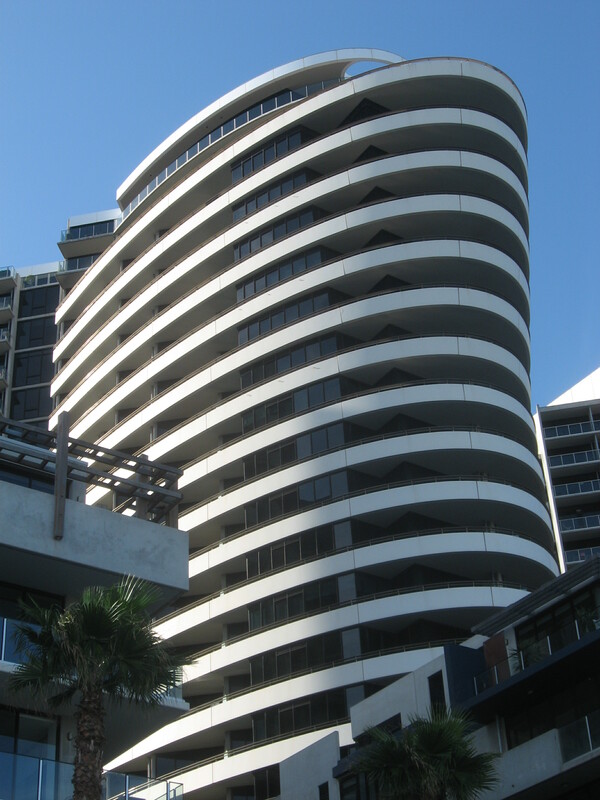 But this also has been a bonus with a review unit that has “done the rounds” and been handled by many reviewers. This would be a bonus for radios that are likely to be handled by many users or spend their working life in a kitchen. When I bought my own one of these sets, I had it working as a “utility radio” for the household and at times had seen it used in a workshop and outdoors while there was carpentry work going on. This hasn’t had any impact on the set’s finish or operation. The 3.5mm headphone jack could be positioned up front so as to allow “walk-up” headphone use and could be set to override a 3.5mm external-output jack on the back as well as the built-in speaker. The role of this rear-mounted jack could be determined by a menu option as a “line-out” jack independent of the volume control and headphone jack or an “external speaker” jack that is dependent on the volume control that can be set to either run with or override the internal speaker. 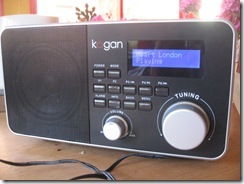 This would allow Kogan to supply a “right-channel” active speaker as an accessory thus causing the radio to become a 2-piece stereo radio. The manufacturers could relocate the USB port to the front of the set thus removing the risk of problems associated with dust and foreign objects falling in to the top-mounted USB socket. The display could be improved as far as legibility goes. It could be a high-contrast LCD with a strong LED-array backlight. Some other reviewers wanted to see a variable backlight display, which could make the set fit for use in a bedroom. 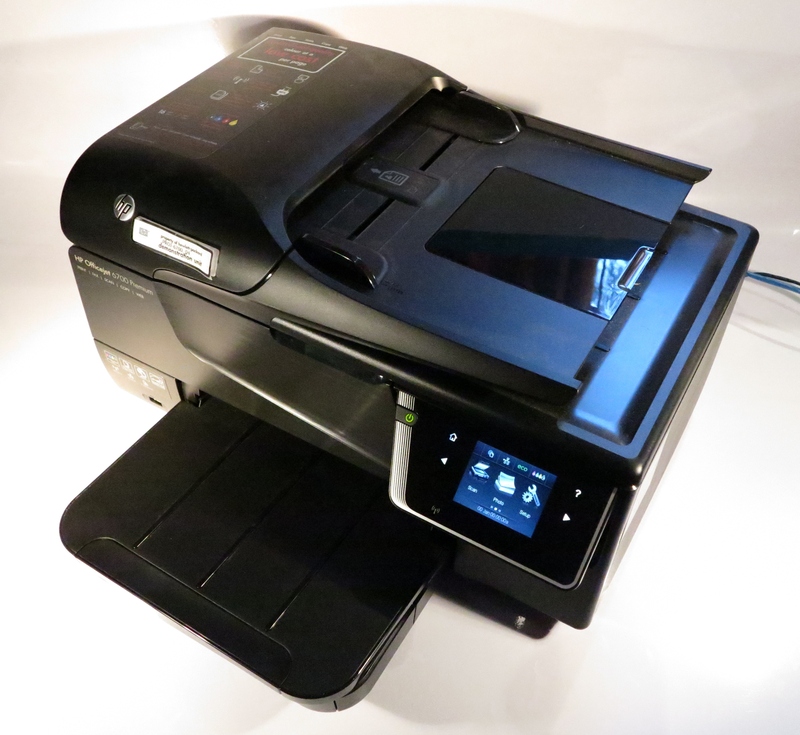 This would be best executed with a backlight setting for standby use and a setting for whenever the set is in operation. There could be the possibility of some form of tone control, not just as a “bass-boost” option. This could be in the form of the classic “tone” control knob used on older sets which provided a bass-rich sound at the low setting and a bright treble-rich sound at the high setting. 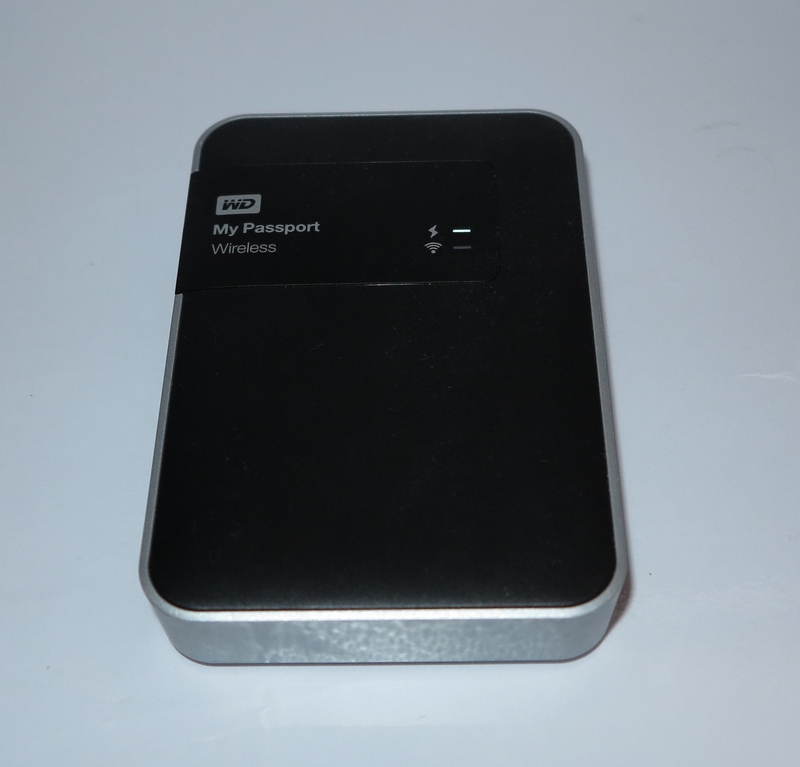 Some users may take one of these sets between multiple locations like home and work or home and a friend’s house or holiday home; as I have often seen with some clock radios and portable radios. An improvement that I would like to see would be to allow the user to have up to eight “network profiles” stored in the radio, like what happens with computers and mobile phones. There could be an SSID and WEP/WPA passphrase associated with each of the profiles so the set doesn’t have to be reconfigured when it is taken between regular locations. Similarly the set could support WPS “quick-connect” options so as to avoid messing with “pick-and-choose” WPA passphrase entry. This set would be best suited as a radio you may use in a small office, household kitchen, small shop or waiting room at a doctor’s or lawyer’s office. It is also a set worth considering for the workshop or garage even though it is as loud is most typical clock radios because of the fact its finish isn’t susceptible to these working environments. It wouldn’t be appropriate in the bedroom as a replacement for that old clock radio because the set would be too big for a bedside table, the display is too bright even when switched off and the alarm-clock functionality isn’t easily accessible. 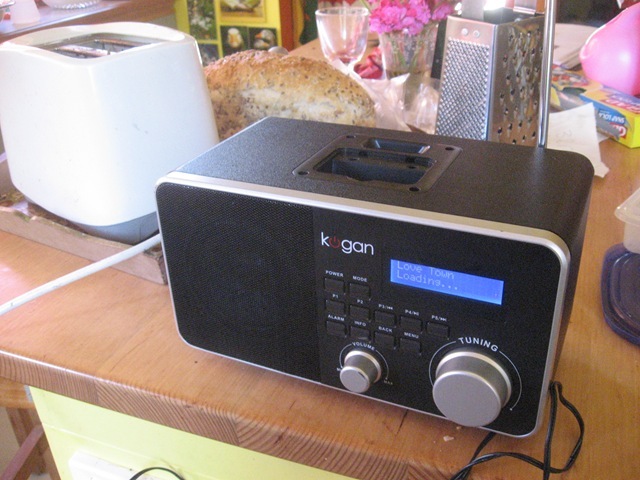 I also applaud Kogan for providing a tabletop Internet radio that is positioned at a price that most people can afford and this could be a way for them to cut in to the premium table radio scene. They could go further with a unit that has two speakers, a portable DAB+/Internet radio that can run on batteries or AC, or a tuner that can pick up FM, DAB+ and Internet radio; with all these sets being capable of playing audio from DLNA Home Media Networks. 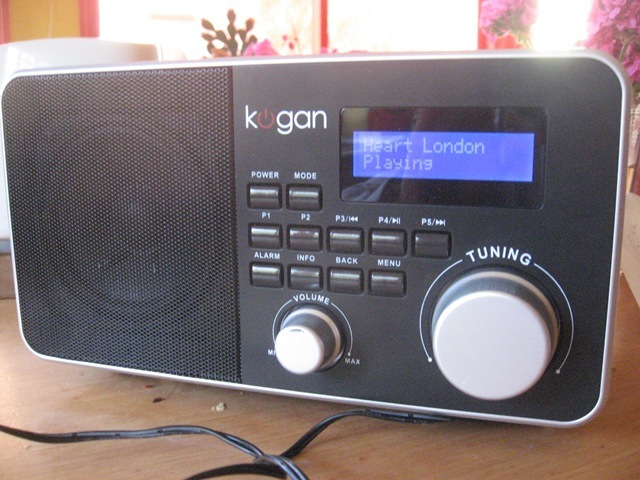 But I would still recommend the Kogan Wi-Fi Digital Radio with iPod Dock as a value-priced entry-level DAB/Internet radio for situations such as your first Internet radio or when giving someone an Internet radio as a gift. It may also be a good excuse to ditch that tired old radio in the kitchen or office for something that offers a lot more. I have had this set on loan for a week courtesy of Kogan and their public-relations company, Profession Public Relations. As well, Professional Public Relations have offered the set for sale to me at a reduced price as per their standard practice with media and I had taken up this offer. The review has been updated with further notes from my experience with this set and may help with your purchasing decisions. There is some solid information on this blog. I like how you put things. I’ve added you to my boomarks and will be sure to spread the word to my friends. I did have a problem with how quick the website loaded. Might be a problem to optimize.